vSphere Data Protection (VDP) is a robust, simple-to-deploy, disk-based backup and recovery solution. VDP is fully integrated with VMware vCenter Server and enables centralized and efficient management of backup jobs while storing backups in de-duplicated destination storage. •VDP leverages VMware vSphere API for Data Protection (VADP) which includes Changed Block Tracking (CBT) along with the EMC Avamar variable-length segment de-duplication engine to optimize backup and recovery times. Initial backups take a fair amount of time, but subsequent backups can be as little as a few minutes depending on the number of changes that have occurred since the last backup. •Backup agents are not needed as VDP leverages VADP. VMs are backed up to disk-based storage (.vmdk files attached to the VDP virtual appliance). •De-duplication occurs not only within each VM, but across all backups jobs and all VMs being backed up by the VDP appliance. •A VM that utilizes an agent for backup and recovery require the VM to be in a powered on state. With VDP, that is not the case – backups and recoveries can be performed regardless of the VM’s power state. •The is no need to install backup management software on an administrator’s workstation. Configuration and management of VDP is web browser based. Currently supported browsers: IE 7, 8 on Windows. Firefox 3.6 and higher on Windows or Linux. Adobe Flash is required. •Restores can be entire VM or individual files and folders/directories. The file-level restore user interface (UI) is web based, simple, and intuitive meaning end-users can perform self-service file-level restores (administrator permissions required). •Deployment, configuration and management of VDP is done via a web browser based graphical user interface (GUI). The majority of configuration tasks are completed using intuitive wizard-driven workflows. •VDP is a virtual machine appliance deployed from a .ova (open virtual appliance or application) file. •vSphere API for Data Protection (VADP) is utilized by VDP. This includes the Changed Block Tracking (CBT) mechanism. CBT tracks the changes made to a VM at the block level and provides this information to VDP so that only changed blocks are backed up. This significantly reduces storage consumption and speeds up backup and recovery times with VDP. •The appliance is deployed by default with 4 vCPUs and 4 GB RAM. •Available in three sizes: 5 TB, 1 TB, and 2 TB – these are usable destination datastore sizes. The actual amount of disk space (thick provisioned) consumed by the appliance is 850 GB (3 .vmdk files), 1600 GB (7 .vmdk files), and 3100 GB (13 .vmdk files) respectively. Thin provisioning can be used, but the administrator should closely monitor disk consumption. It is important to note that once the VDP appliance is deployed, the size cannot be changed. •The VDP appliance guest OS is SuSE Linux 11. •vCenter Server 5.1 is required to use VDP. 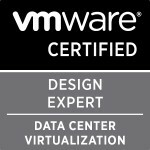 VDP can backup VMs on hosts running vSphere 4.0 and higher. •VDP management is done via the vSphere Web Client. There is no plug-in for the vCenter Server “thick” client. Categories: Virtualisation | Tags: Virtualisation, virtualization, VMware, VMware vSphere Data Protection, vSphere 5.1 | Permalink.